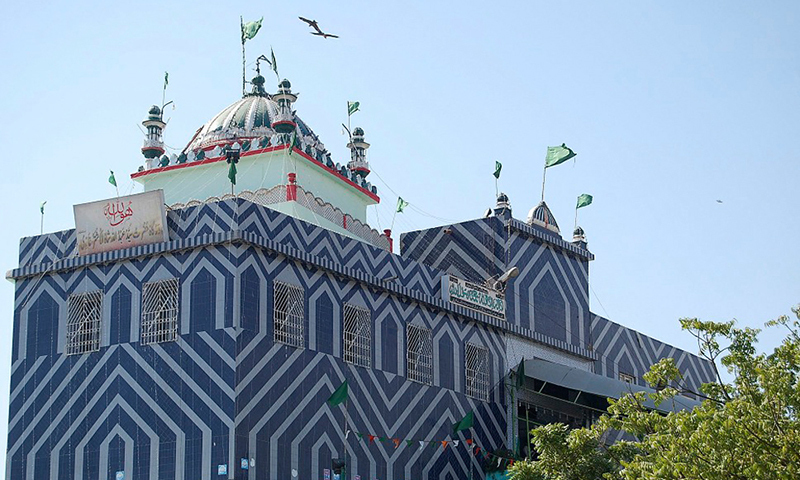 One of the most popular urban myths of Karachi is related to what is perhaps its largest Sufi shrine: the shrine of Abdullah Shah Ghazi. Built on the sandy shores of the city almost 10 centuries ago (as the final resting place of an obscure Sufi saint called Abdullah Shah Ghazi), for a long time the saint’s many admirers have believed that the reason cyclones usually miss hitting Karachi is squarely due to ‘the mystical power and presence of Shah Ghazi’s spirit that resides within the shrine’. Of course, many Karachiites also laugh off such beliefs, but even to this day there are a number of people in this city who are convinced that Shah Ghazi’s spirit remains Karachi’s best deterrent against raging cyclones emerging in the Arabian Sea. Till the early 1950s the shrine was just a tiny, shaky hut on top of a sandy hill in what we now know as the Clifton / Sea View area in Karachi. Precious little is known about what it was like in the centuries before it was first properly photographed in the late 1940s and then in the early 1950s by famous actor, author and intellectual Zia Mohyeddin. One of the city’s foremost architects and historians, Sohial Lari, suggests (in his book, A History of Sindh) that Shah Ghazi was an Arab merchant who had come to Sindh with the first wave of Arab invaders. However, another noted historian, M. Daudpota, suggests that Ghazi arrived in the area from Iraq as a commander who, along with Muhammed Bin Qasim, fought Sindh’s Hindu ruler, Raja Dahir, in the seventh century. He settled in Sindh along with his brother, Syed Misri Shah, and became a follower of Sufi strands of Islam. He was, however, ambushed by his enemies in a forest in the interior of Sindh and killed. The handful of followers that he had gathered carried his body all the way to the shores where he had first set foot in Sindh. They buried him on top of a hill near the area from where he had arrived on an Arab ship. This area now lies in the vicinity of Clifton and Sea View in Karachi. For centuries the tiny shrine continued to draw dedicated devotees of Ghazi (both Muslim and Hindu). It began to be expanded and beautified in the mid-1960s by the Ayub Khan regime, especially after it had begun to attract the devotional attention of the large number of working-class men and women who began to migrate to Karachi from small towns and villages in the Punjab, Sindh and Khyber Pakhtunkhwa. Soon a whole culture of festivities and music (Qawalli and dhamaal) and small shops began emerging around the shrine. The Z.A. Bhutto regime (1971-77) further expanded the shrine and it was during this time that it became one of Karachi’s largest Sufi shrines, attracting not only Muslim men and women, but also members of the city’s Christian and Hindu communities. Though the shrine remained to be a popular spot for the city’s ever-growing working-class and lower-middle-class segments (of all ethnicities and faiths), it was largely neglected by the reactionary Ziaul Haq regime (1977-88). It began to look shabby and in a dire need of repairs. Consequently petty crime and drug peddling became unwanted norms around it. In 2005, the city government headed by the Muttahida Qaumi Movement (and backed by the Musharraf regime) started an extensive repair, cleaning up and renovation job on the shrine which was completed in 2007. Another interesting aspect related to the shrine is that most of the people who visit it are Urdu-speaking and Punjabis. According to a Sindhi nationalist whom I had befriended at college in the 1980s, most Sindhis saw Shah Ghazi as an aggressive invader who used the sword against the ancestors of Sindhis. According to him Sindhis were devotees of Sufi saints such as Lal Shahbaz Qalandar and Shah Abdul Lateef because they arrived in the region purely as peaceful Sufis. Shah Ghazi may have been a warrior-turned-Sufi, but his shrine was bombed in 2010 by militant extremists who believe that Sufism encourages ‘negative innovations’ and negates the purity of the faith. But the shrine survived the carnage and continues to attract a large number of working-class and lower-middle-class Karachiites, and the city’s homeless and the downtrodden. To these men and women, Shah Ghazi embraces all. Of course, all except cyclones. Most attractive part of this showdown by the writer is mentioned in brackets (and back by the Musharaf regime). I am not one for visiting shrines, mausoleums and graves for sprinkling flower petals, "chadar charhana" rituals and listening to qawali singing. But I do respect those who do it and out of curiosity wonder if there is a spiritual radiation around these places where the prayers and "mannats" that are requested are really answered. Or is it just the weak at heart who are attracted to such places where they think their sins will be forgiven by mere attendance. Plenty of such places exist across the border too and appear to be driven from a commercial angle. If Ghazi Shah was a fearsome sword wielding invader then he is no match for the current breed of throat slitting crusaders. May God help us all including the Sindhis. As always, intriguing and informative piece by NFP. Interesting dichotomy between the groups of worshipers at Abdullah Shah Ghazi’s shrine. Had no idea his shrine wasn't popular with local Sindhis. Clear from the history, was no meaning even till 50s until someone had added a commercial aspect and not it is flourshing business center. I appreciate the innovation of that someone, why can't this be done in our basic, social civic life. Perhaps it will have a twisht toward betterment. The writer should do more research on the subject.The linage of the Saint is recorded at the shrine with the year and should have been mentioned.Much is lacking in this article.The writer should have visited the shrine before writing this article. @Truth.... that is all it is a commercial center... THE MOSQUE RIGHT NEXT TO THIS SHRINE IS ALWAYS EMPTY. while you see thousand gathered around his grave hoping for their prayers to be answered... i guess it is all about faith...One cannot possibly understand the teaching of the saints unless one has a pure mind and is trying to imitate their life. We love the myths of saints and the super natural. @Nauman M article lacks research and does not present the true picture. sindhis visit a lot and all poor and rich love and respect him. Ghazi must have arrived with many others in the invading party. What happened to them and why they are not given the same reverence? Is it because they got buried in dusty graves whereas Ghazi got the top seaside plot? I don't personally have a problem with people going to shrines and do what they do, I don't believe in it, though a big fan of the literature that some of these have left behind. As far as Mr Ghazi (or whosoever he/she is) is concerned at the end of the day it is still a myth with no evidence no literature a feel good story at best. Now in this day and age believing that somehow his spirit is turning the cyclones around is ah... what can I say.... Maybe if we had Universities with research resources we would have figured out really why the cyclones turn away from Karachi, but the way things are I don't think Mr Ghazi or his spirit has to worry about his thunder getting stolen by Science. Also used to be a good spot to get your chemical (chemically induced spirituality) needs satisfied as well back in the day. Every such shrine is a super opportunity for entrepreneurs to set up shops and businesses. @khanm People with pure minds don't exist (except children's at very young age). If they do, they don't go to shrines, temples, mosques and churches. @Me shocked Feeling jealous because you wouldn't even qualify for a cab driver? Did karachi or it's forerunner port suffer cyclones before the monument of shah ghazi was built? Another Gem by NFP, I just wish to add only one thing. Sufi saint, Hazrat Abdullah Shah Ghazi, as per his family tree is Hassani / Hussaini Syed i.e. he happened to be a descendant from progeny of Prophet Muhammad (SAWW) therefore, holds a very distinctive plane among Sufi Saints. @Test Excuse me, where exactly is the intrigue? NFP, you are simply the best!!!!!!!! I always love and agree with your thoughts. You are one of the writers who really shaped my world view. God bless you!!!! Thanks for writing about the life of Shah Ghazi and the enlightenment,spiritualism from the Sufi would continue to benefit Pakistan and lands beyond the sea.